Brett Shaffer is getting pretty good at $1,500 No-Limit Hold’em tournaments. Last year, he won his first gold bracelet and $665,397 in a $1.5k NLHE event with 2,816 players. The Kansas native added a second bracelet this year by outlasting 1,631 players in a $1.5k NLHE tourney to win $418,435. One notable change from last year to 2014 was the shape of his chip stack heading into the final table. He came into his most recent final table third in chips, which gave him a lot more room to work with. However, last year’s event proved far tougher since he was one of the smallest stacks at the final table. 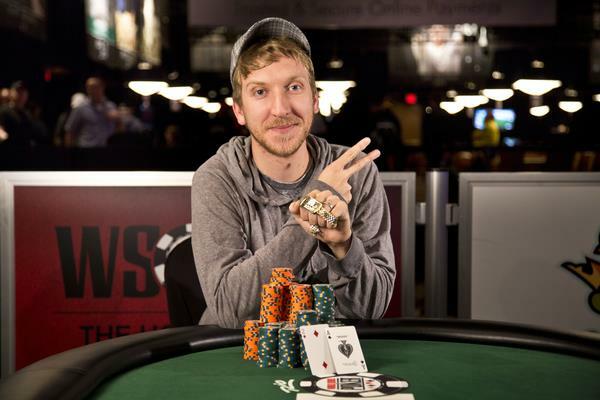 But in both cases, Shaffer came away with a victory and now he’s a two-time WSOP champ. Winning the Main Event isn’t always a recipe for long-term success at the WSOP. In fact, 2001 ME champ Carlos Mortensen was the last former winner to capture a second gold bracelet, which he did in 2003. But now the drought is finally over since 2009 ME winner Joe Cada won his second bracelet and $670,041 in a $10k Six-Handed NLHE event. Cada definitely earned this victory too when looking at the final table, which included Jeremy Ausmus (2nd, $414,104), Max Silver (3rd, $273,646), JC Tran (4th, $185,971) and Erick Lindgren (5th, $129,192). He also had to overcome a chip disadvantage while facing Ausmus heads-up. Perhaps it shouldn’t really come as a surprise that Cada was the one to finally break the bracelet cold streak for Main Event winners. He’s been knocking on the door of winning a WSOP tournament for the past two years, finishing second in a $1.5k NLHE event two years ago and taking fourth in a couple more $1.5k Hold’em tourneys last year. Cada now has $9.95 million in WSOP winnings, which places him fifth on the all-time list. Just a few months ago, Dutch Boyd was writing a book about the ups and downs of his life called Poker Tilt. Now, Boyd might want to start writing a Hollywood script about his poker career after winning his third gold bracelet in a $1k NLHE event. There are few figures in the poker world who are more polarizing than Boyd. After graduating from law school at age 18, he quickly opened an online poker/casino called PokerSpot. Unfortunately, the site ran into credit card processing issues and failed. Boyd remained in the poker world to see brighter days, including his bracelet wins in 2006 and 2010. But he’s been broke in more recent years, taking to Kickstarter.com to raise money for his book. Considering all of this, Boyd was something of a popular underdog figure as he played through a 1,688-player field and on to the Event #33 final table. He certainly wasn’t an underdog due to a lack of poker skills, but rather how down he’s been doing financially in recent years. So most poker followers would agree that it was sweet to see Boyd win his third bracelet and $288,744.